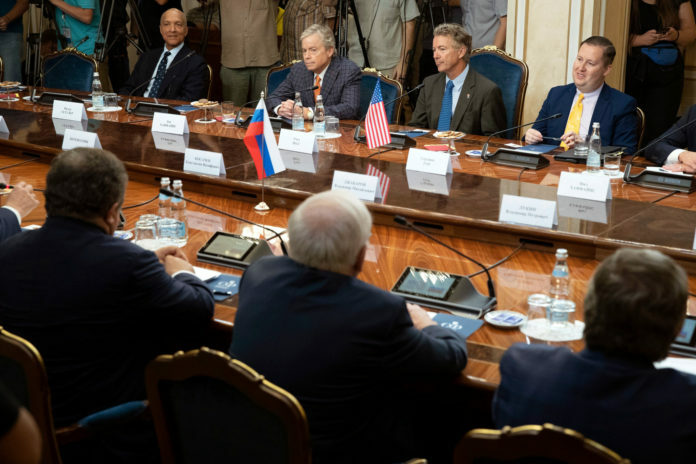 Senator Rand Paul, second from right, during a meeting with Russian lawmakers in Moscow on Monday. He has invited some of the lawmakers to visit Washington. MOSCOW — There may be little that pleases Senator Rand Paul, the libertarian-leaning Kentucky Republican, more than thumbing his nose at Washington groupthink. So it was on Monday when Mr. Paul, decamping for the Senate’s one-week recess, took his lonely defense of President Trump’s Russia policy to Moscow to deliver a show of contrarianism all too familiar to his colleagues back home. “I’ve traveled here to say that there are many Americans who want to have diplomacy, that want to have engagement; I’m one of them,” Mr. Paul said, standing beside Konstantin Kosachyov, the chairman of the foreign relations committee of Russia’s senate who has been subject to American sanctions since April. At home, Mr. Paul’s fellow senators speak in grave tones about how to respond to an alarming pace of revelations about the scope and durability of Russia’s campaign to undermine the democratic process — an effort that American intelligence officials warn remains active despite American retaliation. One plan, introduced last week by three Republicans and three Democrats, calls for “crushing” new sanctions. Mr. Paul has something else in mind — maybe even taking some Russian lawmakers back to Washington. As he stepped out of a meeting with senators of the Federation Council, the upper chamber of Russia’s parliament, on Monday, Mr. Paul said that he had extended an invitation to members of its foreign policy committee to visit Washington. The two sides would also try to arrange a meeting in a neutral third country, he said — which presumably would allow Mr. Kosachyov to attend without the pesky issue of sanctions hanging over his head.